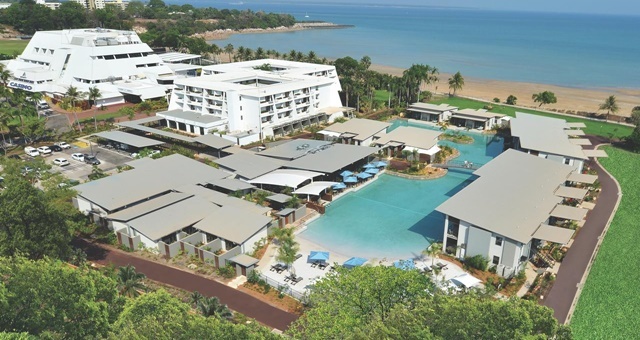 The former SKYCITY Darwin will be renamed Mindil Beach and Resort from later this month. Regulatory approval has been granted to American hospitality giant Delaware North for its previously announced acquisition of the former SKYCITY Darwin, with full transfer of ownership to take place later this month. Following the transfer, the property will be renamed as Mindil Beach Casino & Resort, after the west-facing beach adjacent to the property. The resort’s new title is highly reminiscent of its original name, with a slight adaptation to reflect the improvements made over the years. The new name comes with significant involvement in the form of two focus groups involving the NT Government, Darwin Chamber of Commerce, local businesses and frequent visitors. An overwhelming consensus concluded the venue should include a name reflecting its physical location and the history of the region. Mindil Beach Casino & Resort will soon roll out a new logo featuring a north-pointing spade from a standard deck of cards backed by swaying palm trees. The logo will be progressively rolled out across all facets of the resort and casino’s operations, including uniforms, casino collateral such as gaming chips and across all of the resort’s marketing assets. A major national marketing campaign will follow shortly after in an effort to raise awareness about the rebranded facility. “This place began its life as Mindil Beach Casino and we think it’s a fitting tribute to the location, the venue and its patrons that we honour its legacy by reverting to the original name, albeit with a subtle adaptation to recognise the resort features that have been introduced over the years,” said Delaware North Managing Director, Gary Brown. “It’s an honour to have Mindil Beach Casino & Resort join Delaware North’s stable of gaming and entertainment properties. “We look forward to growing the venue and its many offerings, and in so doing, helping to grow the local economy through jobs, tourism and investment,” Brown added.